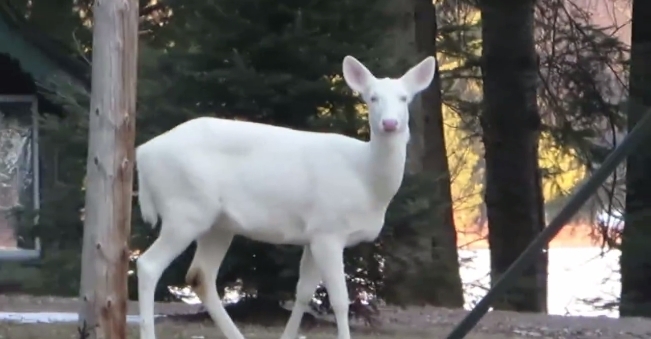 An ultra-rare gathering was caught on camera in northern Wisconsin when footage was captured of three albino deer in a single location. The three albino deer were recorded Wednesday in a field with two normal-colored deer near Boulder Junction in Northern Vilas County. Albino deer are extremely rare, occurring about once in every 20,000 deer births. Two albino deer were previously photographed playing together in the same area in 2013. The albino trait is so rare that Wisconsin bans hunters from shooting white deer. The Native Americans believed the occurance of a white animal was a huge sign of prophecy – a sign from the great spirit that a major shift in their world was to come. There is also a Lenape legend about white deer that predicts that when a pair of all-white deer is seen together, it is a sign that the indigenous peoples of the Dawnland will all come together and lead the world with their wisdom. Many tribes and indigenous peoples throughout the world have similar myths. The Seneca, Roanoke, Algonquin, Nanticoke, and Pocomoke tribes all relate sightings of the Great White Deer. The Celts considered white stags to be messengers from the “other world” and their appearance was said to herald some profound change in the lives of those who encountered them. Responses to "Ultra-rare gathering of three albino deer caught on camera"